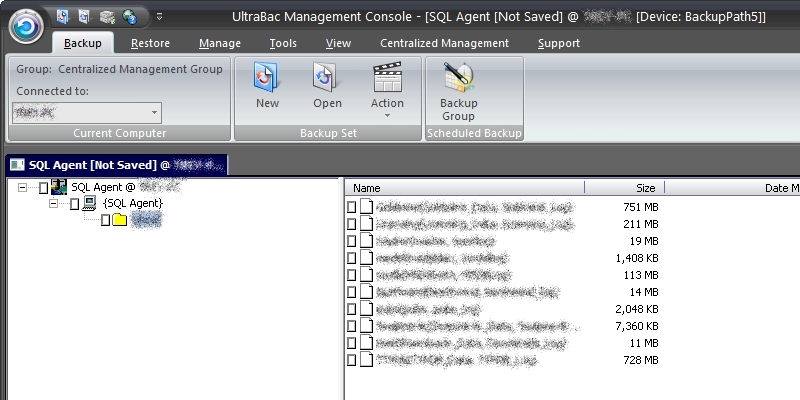 Using the UltraBac SQL Agent, Microsoft SQL can be backed up online, without stopping the services prior to backup. If the SQL services are not running, the backup will not be successful. The SQL Agent must be installed on each of the SQL servers you are planning to back up. UltraBac supports SQL 2005, SQL 2008, SQL 2008 R2, SQL 2012, and SQL 2014. UltraBac no longer supports SQL 2000. NOTE: The backup account must have either DB ownership or Administrative rights on each of the databases to be backed up. From the Manage tab, click "Agents"/"SQL Agent." Fig. 1 - SQL Agent global default options. Type the SQL server name into the "Server instance" field, or wait for UltraBac to detect the SQL servers in the network and then highlight the desired server by clicking on it. Fig. 2 - Editing the SQL server list. Repeat steps 3 and 4, as needed, for each server to be backed up. When all servers have been added, click "OK."
NOTE: SQL database names cannot contain "(" or ")" characters. If a database has those characters in the name, it will create an enumeration error. Launch the Backup Wizard by selecting the Backup tab and clicking "New." 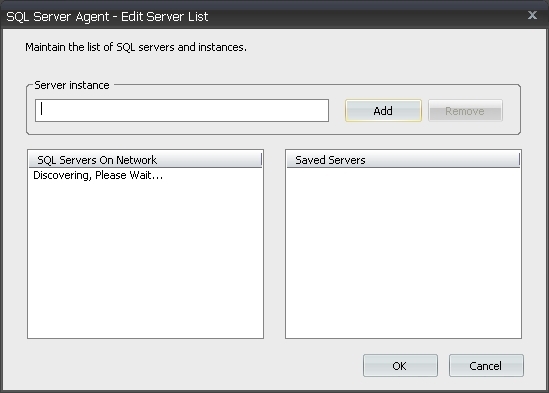 Click "SQL Agent" to highlight the option and click "Next." Highlight the server to be backed up and click "Next." If the SQL server required isn’t displayed (it references the SQL server list), either type in the name of the SQL server\instance or click the "Discover" button to automatically detect the SQL servers in your network. Fig. 3 - Select MS SQL server/instance to be backed up. Set the Backup Type from the drop-down box. Check the Security Options and click "Next." Fig. 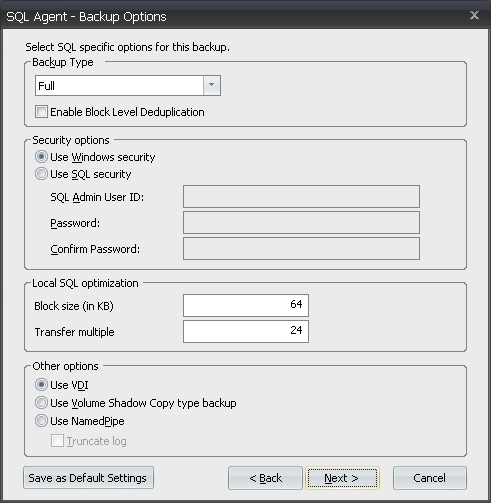 4 - SQL Agent Backup set options. The Local SQL optimization settings appear as "Block size 64" and "Transfer multiple 24" by default. These are the recommended settings. Select a radio button under Other options. "Use VDI" is automatically selected by default. Use VDI – MS SQL 2000 and newer. Use Volume Shadow Copy – MS SQL 2008 and newer. Use NamedPipe – MS SQL 2000 only. Type a description for the set as it will appear in the backup log and click "Next." Click "Finish" to load the SQL set into the file viewer. Fig. 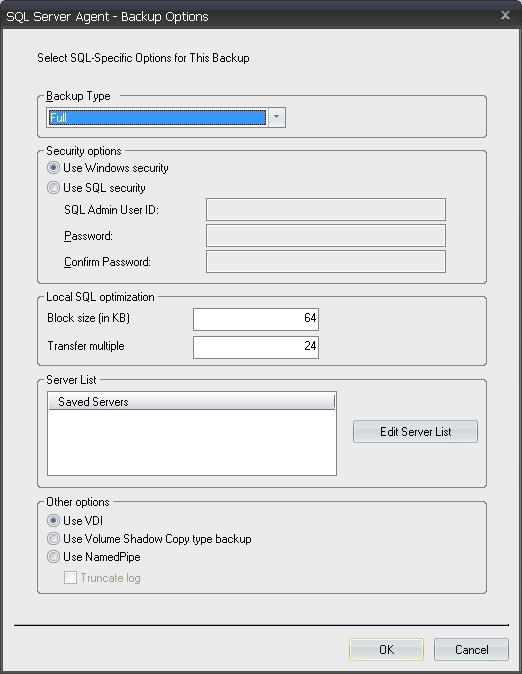 5 - SQL backup set loaded in the File Viewer. These options modify the way UltraBac handles SQL data during backup. Local Search Only – Displays only the servers listed in the local "Client Network Utility." Network Search Only – Queries and displays all SQL servers on the LAN. Local and Network Search – Displays all servers listed in the local "Client Network Utility" and all servers queried on the LAN. Full – Backs up all selected databases and transaction logs. Incremental – Backs up and truncates the transaction logs. Differential – Backs up the transaction logs, but does not truncate. Local SQL Optimization – Defines the block size to be used during backup. The default is 64KB. The transfer multiple is 24. In most cases, these preference should not be changed. Windows security – Uses the accounts specified in the UltraBac accounts under "Manage"/"General"/"Authentication"/"Accounts" during the SQL backup. SQL security – Uses the specified SQL security account during the SQL backup. Use VDI – Forces UltraBac to use the "VDI" protocol during backup. Use Volume Shadow Copy – Forces UltraBac to use the "Volume Shadow copy" protocol during backup. Use Named Pipe – Forces UltraBac to use the "Named Pipes" protocol during backup. Truncate Log – Truncates the transaction logs after the selected backup operation is complete. If this preference is not checked, the transaction logs will NOT be truncated. Select the objects for restore. 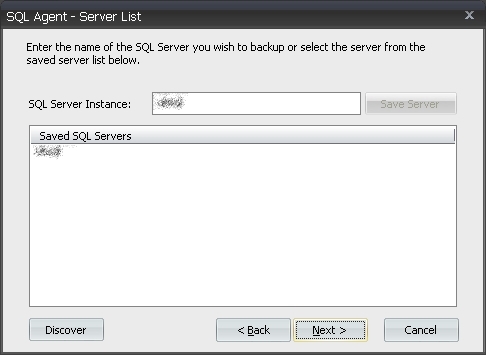 To restore the SQL database to the original location/server, click "Next" at the "SQL Agent Restore Options" screen. At the "Restore Options" screen, click "Restore." NOTE: When restoring incremental or differential SQL backups, the full backup must be restored first, then all incremental or differential backups must be restored in the order they were backed up. UltraBac also has the ability to restore a database to an alternate server, or the original server, with alternate database and file names. Fig. 6 - SQL Agent Restore Options. Restore Destination – Drop-down menu lists all servers registered in the local Client Network Utility. Use Windows security – Uses the current login account for restore. 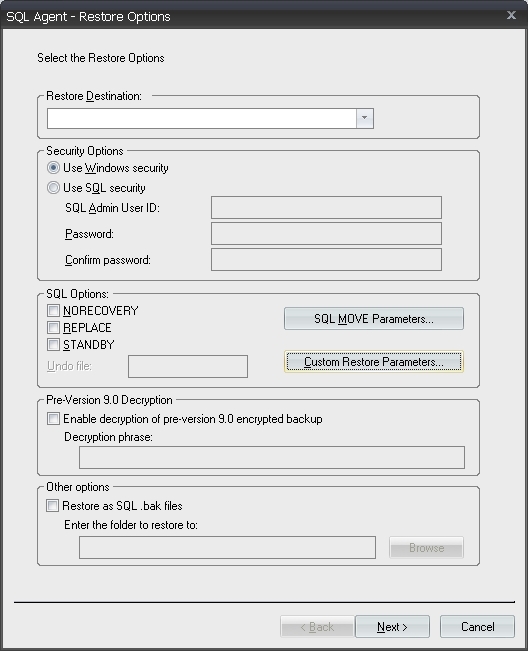 Use SQL security – Uses the specified credentials for restore. REPLACE – Used when restoring a database to a remote SQL server, when the same database name exists on the target machine. SQL MOVE Parameters – Use to move or rename files when restoring an SQL database. Custom Restore Parameters – Custom restore parameters can be specified to perform a "point-in-time" restore, or any custom restore available to SQL. Pre-Version 9.0 Decryption – Prior to UltraBac Version 9.0, the software used Blowfish encryption. Selecting this option will allow you to restore any SQL backups that were made with versions of UltraBac prior to 9.0 that used this type of encryption.